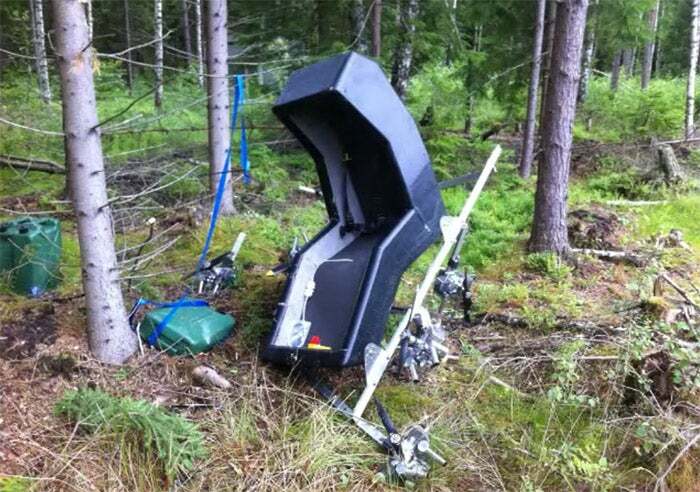 A Swedish engineer has created this wonky, flying contraption, made from eight gas-powered propellers, a small tube frame, an open seat and an R/C controller. Is it a manned drone aircraft? A multi-copter? Not only is this thing loud, it appears that safety has taken a back seat to fun. On YouTube, the engineer has posted at least 12 videos documenting his process building, testing and tweaking the flying chair thing. At some points in the videos he buzzes about 15 feet off the ground. At others, he suddenly veers out of control. He even had a nasty crash, dropping down among some trees. “These lessons are expensive, not only measured in money,” as the guy, called “amazingdiyprojects” on YouTube, says in the video documenting the crash. Miraculously, he survived without a propeller embedded in his skull. The seat doesn’t offer much protection from those fast-spinning blades. Other than this craziness, the engineer has created things like an electric skateboard and a homemade BB gun machine. As for this flying doohickey, who knows what its real-world applications would be? I’m all for the passion that DIY-ers (do-it-yourselfers) have for creating all sorts of cool stuff. But, let’s keep it safe, kids.